Whether you call it a cocktail ring or right hand ring, this remarkable ring will get noticed! The center sapphire takes center stage while two rows of diamonds surround it with just a trickle of sapphire giving another dimension to the otherwise oval design. The low profile makes it very wearable for everyday and able to blend into so many styles. 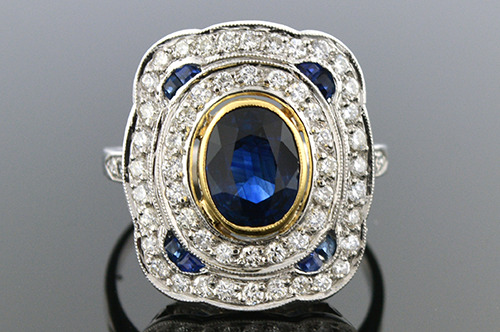 The center holds an oval sapphire that has a weight of approximately 1.50 carats and is set in an 18 karat yellow gold bezel. Surrounding the center are 54 round brilliant cut diamonds that have a weight of approximately .75 carat total weight. these diamonds have an average color grade of G-H and an average clarity grade of VS(2)-SI(1). Made of platinum this ring is currently a size 6.5 and can easily be sized up or down.